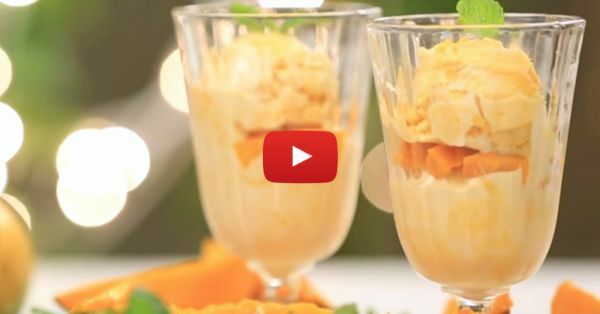 How To Make *Delicious* No Churn Mango Ice Cream At Home! - In a large bowl, whip the cream until soft. - Add the condensed milk and whip again, until thick. Add vanilla essence and mix well. - Puree the mangoes in a blender. Add a little milk - if it’s too thick. - Pour the cream mixture into an airtight plastic container. Pour blobs of the pureed mango on top and swirl with a toothpick. - Cover and freeze overnight. Let it sit at room temperature for 10 minutes before serving. Garnish with chopped mangoes and mint leaves. For more, do subscribe to POPxo Yum here.